Salamanca, 05/03/2014. 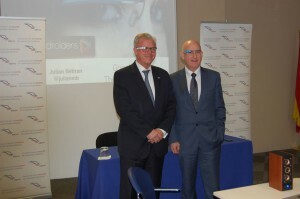 Adventia, European Collage of Aeronautics this morning has become the first airline company to carry out a flight with Google Glass, and also the first school in the world to use this type of device in pilot training. This demonstration has taken place as part of the Pilot Innovation Day and the first conference on “Innovation in the Cockpit”, organized by Adventia, Participating Centre of the University of Salamanca at the Aeronautical Campus at Matacán, Salamanca, Spain. Among those attending were: the Chancellor of the University of Salamanca, Daniel Hernández Ruipérez, the dean of the Official College of Spanish Airline Pilots,, Luis Lacasa Heydt, the Head of Training of Iberia, Gonzalo Martínez de Abellanosa, the CEO of Droiders, Google developer for Spain, Julian Beltrán and the president of Adventia, Juan Antonio Martín Mesonero. The experience carried out this morning in Adventia, leader in pilot schools in Europe, forms part of the area of research applied to the incorporation of electronic devices in the cockpit, and combines the tradition of a school with an experience of 40 years with ongoing innovation. After analyzing several different tools which have recently been launched on the technological market, Adventia has finally opted for looking into the applications of Google Glass in Air Navigation, with the aim of improving the quality of training of future pilots. Therefore, with the aim of improving flight instruction and training the best pilots, Adventia, along with Droiders, official Google developer, have created an application for Google Glass, adapting the checklist used in the Faculty of Medicine at Stanford University in surgery. The use of this type of device will make many procedures much easier for future pilots, improving their training and will allow airlines to incorporate new electronic devices in the cockpit. 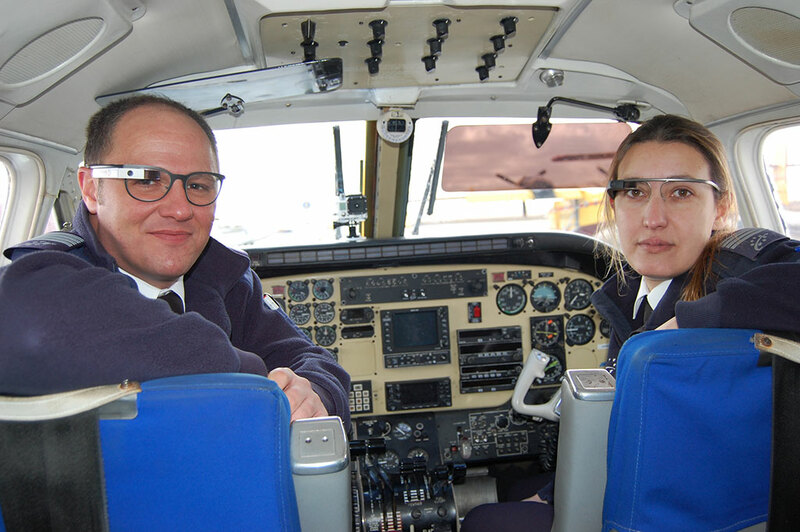 The demonstration has meant that the Head of Training at Adventia, Juan Riquelme and the Chief Flight Instructor, Diana Rodríguez, have been able to use for the very first time Google Glass for the pre take-off checklist, during flight and after landing. For this test, aircraft from Adevntia’s fleet, which includes a turboprop Beechcraft King Air C-90, were used. 1Safety. Google Glass will improve current electronic devices in the cockpit, the electronic flight bag (EFB), by avoiding pilots having to let go of the flight controls to consult data during the flight. According to the Aviation Safety Network, 32% of accidents in aviation are due to pilot error. According to Associated Press, the improvement in technology in recent years has meant a decrease in deaths in accidents in commercial aviation by15%. 2Productivity. Students at Adventia, European College of Aeronautics, Participating Centre of the University of Salamanca, by using Google Glass will avoid losing 26 days a year of practical training due to real-time updating of meteorological conditions, check lists, navigation lists, NOTAMs etc. 3Saving. The use of electronic devices in an airline like Iberia, pioneer in Spain in the use of the “Electronic Flight Bag” (EFB), will mean a considerable saving in print-outs and will reduce the weight transported by 60kg, which in turn will lead to a saving in fuel of about 150,000 € a year in short and medium haul fleets alone. 4 Aeronautical training. An airline may have to invest 2 million euros in training its pilots to adapt them to new aircraft and in refresher courses. By using new technology in their training, the students on the Degree in “Commercial Airline Pilot Studies and Air Operations” will be trained in handling electronic devices. Therefore, the number of hours needed to adapt to new flight devices will be reduced, which may mean an optimisation of 10% in the investment which goes on the training needed to bridge the technological gap. 5 Environmental Sustainability. According to the report “Microsoft in Aviation”, presented on 20th February 2014, the use of the Electronic Flight Bag (EFB) will mean a reduction in carbon emissions equivalent to 12,500 cars and a saving in 7.5 million sheets of paper, which would prevent 900 trees a year from being felled. Adventia, European College of Aeronautics, is leading pilot school in Spain, successor to the National Aeronautical School (ENA). Since 2012 it is a Participating Centre of the University of Salamanca, where it offers the Degree in “Commercial Airline Pilot Studies and Air Operations”, adapted to the requirements of the European Higher Education Area. Adventia is also an Approved Training Organisation (ATO) certified and approved by the main national and international aeronautical institutions and authorities. More than 1,500 students have trained there over the last 40 years. It operates from the Aeronautical Campus at Matacán, located at Salamanca-Matacán Airport (LESA/SLM), a base which is highly privileges due to the meteorological conditions and air traffic, and where the best pilots are trained. Spain is ranked number one as to the quality in airline pilot training in Europe, according to report on Commercial Aviation Pilot Schools in Europe. The Garofali Ranking, was a report prepared by Álvaro Garofali, a specialist in Aviation Logistics. The Spanish pilot schools Adventia (Salamanca), Cesda (Reus), FTE (Jerez de la Frontera) and Gestair (Madrid) are ranked amo ng the ten best schools in Europe. do you want to be pilot?